As a company with 30 years' experience in assisting law firms, we pride ourselves on being upfront and honest. We are transparent about how we work, what we do, and whether we're the right fit for your firm. We don't believe in a 'hard sell'. We believe in building genuine and meaningful relationships with our clients, something that's extremely important to us. We strive to be partners in your success and help on each step of your journey. At Thread, we're committed to innovation and customer feedback. We want to create the best customer experience possible, if we don't let us know. We're passionate about innovation. We're constantly improving Thread to make it the most disruptive cloud-based case management solution, using the software you already know. As Microsoft innovate, we innovate, yet another reason why we've partnered with them. We have a huge resource at our fingertips that we're mining to help you work smarter not harder. All you need to get set up on Thread is an Office 365 plan subscription. Already have an Office 365 plan subscription? Great! We'll be in touch to confirm all the necessary logistics are in place. Then we can have you set up and ready to go in no time. Need an Office 365 subscription? No problem. Our trusted partner will be in contact, explain all the subscription elements and how they can help. 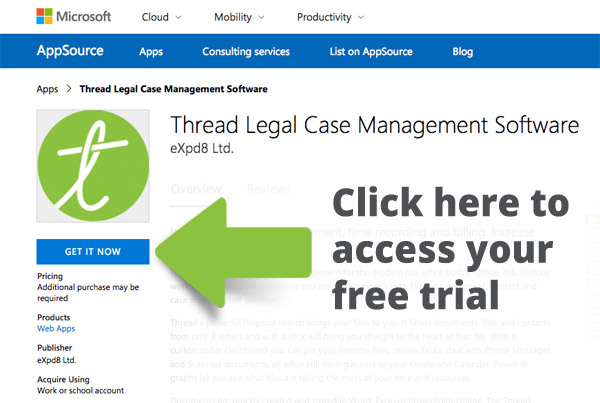 Once your Office 365 subscription is in place, you can have access to Thread in a matter of hours. Contact us today to schedule a personal demo.